Snacks are sure the best way to provide your child with some nutrition. Haven’t we all seen them sulk at a bowl of veggies or salad? So, how do we actually make our food interesting, so that they get the best of both, nutrition and goodness? Well, snacks are the answer. The reason why snacks are important is because it is a light food that only aims to provide the body with ample nutrition. Since most of the kids come back hungry from play or school, they will probably munch on anything that looks interesting. Therefore, it the right time to get them a bowl that is a mix of naturally packed nutrients and energy supplies for the body. Their small tummies cannot handle all the food at one time. These timely nutrition suppliers in the form of snacks are thus every parents’ saviour. So, wondering how to pack all the energy and calorie rich food in a bowl. We’ll give you some ideas. Take a look at some of our easy and simple making school snacks for kids that you can send them with contently. Cookies are kids’ favourite. Here is some way you can play with the ingredients. This time, try raagia millet that is rich in calcium. Thus, it is good for their bones and their high dietary content helps promote digestion and prevent over eating. 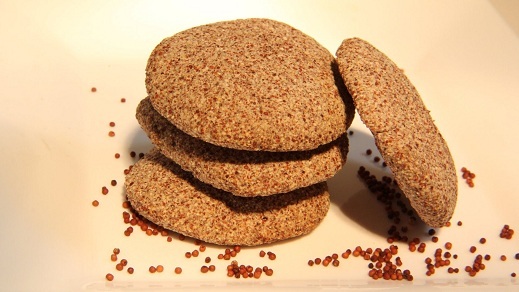 Here is how you can make a delicious ragi cookie. Beat butter (1/4th cup) along with 3/4th cup of sugar. Beat them until they turn creamy. Add 2 eggs and one teaspoon of vanilla essence. Beat them until they mix well. Add a cup of grated coconut, a cup of ragi flour and mix them well. Sprinkle on the moist dough with some powdered sugar and allow it to refrigerate for an hour, covered. Preheat the oven to 180 Celsius for 15 minutes. Make flat balls and place them on baking sheet. This is an easy way to surprise your kid! 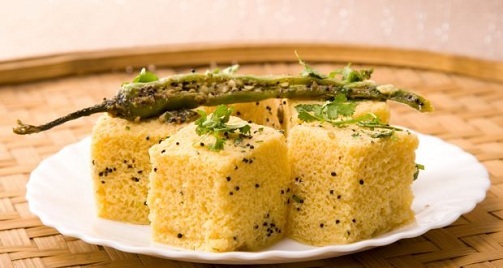 Another interesting menu on our kids snacks list is the all-popular dhokla. A steamed dhokla is made from dal that is a storehouse of proteins and fibre. Besides, it is steamed, which means, it is less of oil and thus even healthier. Make a classic steamed dhokla this way. In one cup of gram flour, add one tablespoon of citric acid, one tablespoon of sugar, salt to taste and a pinch of turmeric. Add water to the mix and mix to see if you get a medium thick consistency. In another glass, add one tablespoon of fruit salt or baking powder and mix well. Once it dissolves, pour it into the batter. Pour the mix into a steaming tray. Allow it to steam for about 15 minutes. In a pan, add two spoons of oil. Add mustard seeds and allow it to crackle. Now add three dried red chilli and curry leaves. This is the classic Indian tadka. Cut the steamed dhokla to the shape of your choice. Pour the prepared tadka over this. That’s how a healthy and tasty dhokla is prepared. Idlis sure will not invite smile. But what about a healthy twist? Oats are high in fibre content and keeps you full for a very long time. Besides, oats is also known to prevent constipation. Their high magnesium content makes them an essential food for the kids. 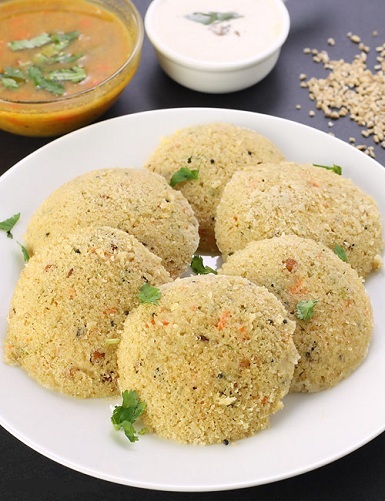 Here is how to make a tasty oats idli. Grind one cup of oats in a grinder to a fine powder. You can add one medium-grated carrots. To make it more colourful, add some finely chopped coriander and half a beetroot. To make the batter, start by heating one spoon of oil in a pan. To this, add channa dal, urad dal and some mustard seeds. Let all of them turn golden. You can add some cashews and green chillies. Add half cup of ravaor sooji and sauté until golden brown. Add the powdered oats, keep stirring, and roast well. Add the grated veggies and half a cup of curd to it. Mix them well with water and ensure idli like consistency of the batter. Grease the idli pan with little oil. Add salt to the batter and pour it on the moulds. Allow it to steam cook for about 7-8 minutes. Serve the idli with your child’s favourite chutney. Nuts and dry fruits are a good source of nutrients for the body, especially when your child loves to play. The nuts are known to replenish the nutrient content and supplies them with enough calories, thus ensuring they don’t feel tired. Combine figs, almonds, cashews, walnuts, raisins, peanuts, cucumber seeds, pistachios, macadamia and a good amount of dates. You can bring in any more nuts you like for the recipe. Add honey to the mix along with some palm sugar. Mix them well and make balls out of it. Roll it on some coconut powder and allow it to dry well. 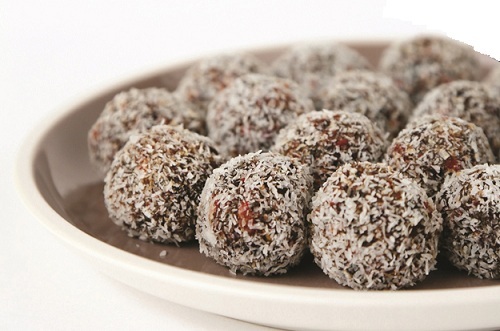 This energy rich ball is the best way to bring in iron (from dates), magnesium (from cashews) and other nutrient supplies for your child’s body. Lentils are the ultimate source of proteins. It is high in vitamin K, vitamin C, iron and folate. They are abundant in their magnesium content and keeps you full for a very long time. Time to make a beautiful and delicious moong salad. Soak the moong overnight and drain them in the morning. Wash them well. 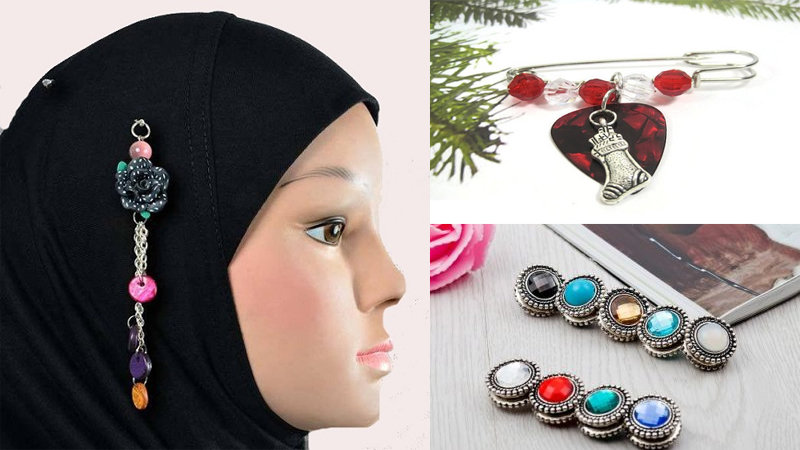 Allow them to sprout by tying them on a piece of cloth. After it sprouts, add a handful of cucumber, finely chopped tomatoes, onions, grated carrots and half a cup of cornflakes for a crunchy taste and finely chopped coriander and mint leaves. Add salt to taste and squeeze some lemon juice. Mix them well. Serve by a side of orange juice. 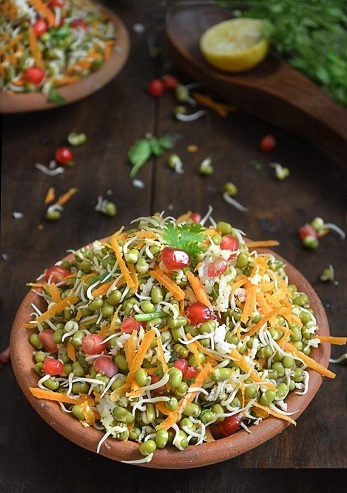 Moong salad will taste great with all the extra flavours added to it. Make sure to serve a bowl of it to your child every evening. children sure deserves some cheese. Cheese contains zinc, calcium, vitamin A and B 12, protein and phosphorous. The healthiest type of cheese is the Feta cheese that is low in fat and calories. Here is a cheese toast that comes with fibre rich capsicum. In a pan of one teaspoon of oil, add cumin and garlic. When they begin to smell good, add the coloured bell pepper/capsicum. Sauté well. Sprinkle some salt and chilli flakes to it. Keep aside when you see it is done well. Now, place the bread on the pan and neatly lay the capsicum on it. Grate the cheese on top of it. 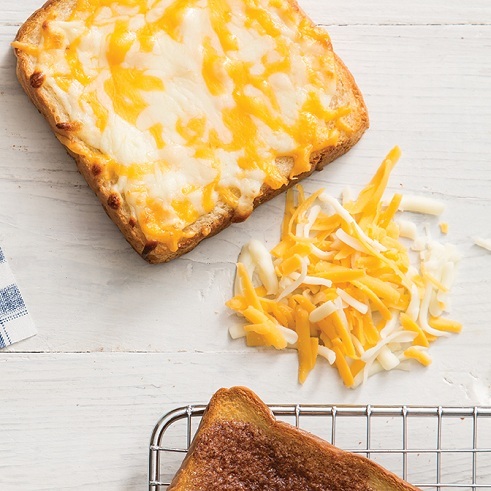 That’s about a delicious cheese toast. This could be an ideal teatime snack for your child. Here is a good snacks for school you could try. Pasta is sure the favourite for many kids. Include some bell peppers and tomatoes to make it healthy and a sauce made of only tomatoes is ideal. Roast some onions or bell peppers in oil and keep aside. Next, roast tomatoes until they turn mushy. Blend them together and in a pan cook the pasta. Add some oil, garlic to a pan and add onions. Let the onions turn transparent. To this, pour the prepared puree. Add salt to taste and allow the mix to cook well until you get a good consistency. Switch the flame off and toss in the pasta. 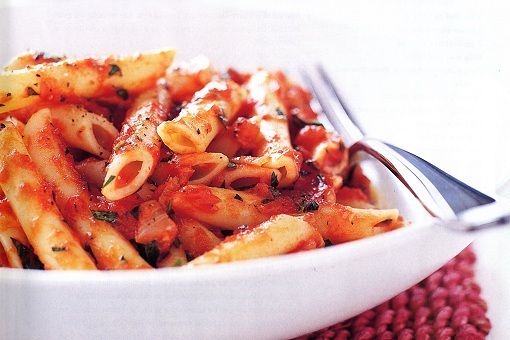 The red sauce pasta will be a sure hit with your child and his/her friends! An ideal snack on a rainy day is a bowl of hot soup. Sweet corn promotes a healthy vision. It contains insoluble fibre will feed the good bacteria in the gut, thus helping in digestion. Chop beans, carrots, onions. Wash them well. In a pan, heat some butter. Add the veggies and one cup of sweet corn. Pour water and allow them to cook well. Sprinkle some salt over. 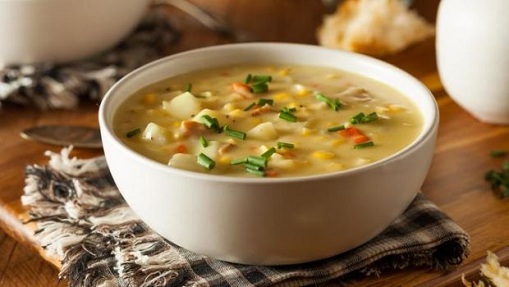 Mix one teaspoon of corn flour in little water in a separate cup and pour over the boiling pan of veggies. Serve the soup hot with a good amount of pepper. the next way to their heart is to prepare an energy rich smoothie. Smoothies are delicious and their goodness lies in the fruits you choose to add. Berries could be your one choice, for they look interesting with a mix of many colours and they are energy givers. 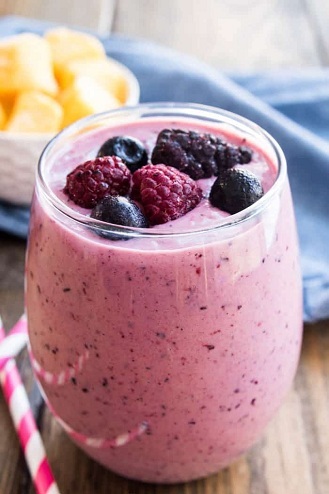 Make a wholesome berry smoothie. In a blender, add raspberry, strawberry and blueberry. To that, add one cup of vanilla yogurt and 1/4th cup of uncooked oatmeal. Add one cup of milk and a spoon of honey. Serve it moderately cold. They will sure love this colourful dish! How more colourful can a bowl of dish get? 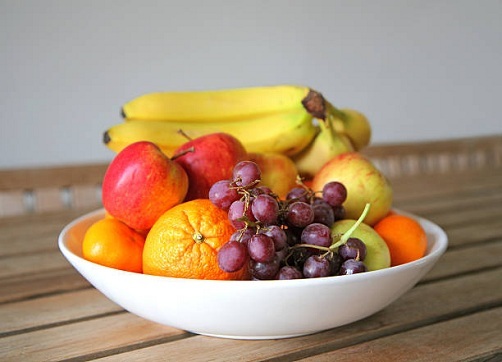 Try out a simple nutrient mix bowl, one that is abundant with fruits. They contain a lot of nutrients, fibre and iron. Here is how to make one. Cut all fruits watermelon, apples, pineapples, kiwi, chikku. Add some handful of grapes, green and black. Sprinkle some flax seeds or flax seed powder on top for added benefit. Serve the salad cold. Your kids will sure love a bowl of it or even more. Try out various bite sized finger foods that are rich in nutrients. Small portions of it also serve the purpose. Make it bright and colourful for getting them interested on the food. Shakes are the best way to ensure they get the goodness of nutrients. Try to use flax seeds in them, in a way that does not hamper the taste. 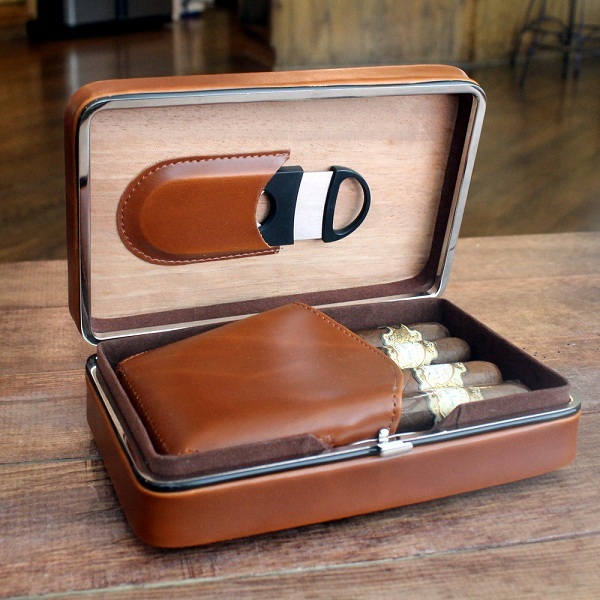 Lastly, remember to present them well. A beautiful and colourful presentation is a must to get them eat. Snacks are an important part of your child’s meal. They ensure they get some periodic nutrients in time to time. These small supplies of energy especially become useful when they head straight back from a tiring day. It just takes small tweaks and twists to the daily food to make it more appealing. Try today and we are sure your kids will love them.